In West Philadelphia, born and raised, on the playground where I spent most of my days. Chilling out, maxing, relaxing all cool, and all shooting some b-ball outside of the school. Of course, times have changed since I was Will Smith back in the late eighties. And to be honest, I’ve only ever been to Philly once, and my memory of it is a little hazy. I don’t even think we went downtown, let alone west. It is, though, where I first met this sandwich and it has now reached an almost mythical status in my mind. I was about 14 when my dad and I went to Philadelphia to stay with family. I have four abiding memories of that trip: waiting in the atrium of the Showboat casino in Atlantic City while my dad very quickly lost some money on the slot machines; eating oyster balls, possibly with horseradish sauce in a seafood restaurant somewhere; recording the local radio station onto a cassette to bring back to England with me and George taking us to an open food truck to eat the famous Philly Cheesesteak. I’ve never had one since. And seeing as how it’s unlikely I’m going to be in Philadelphia for a while, I decided to take matters into my own hands before my desire for one made me do something silly. It seems almost impossible to get the key ingredient here in London, which is Cheez-whiz. I could have it shipped over at ridiculous cost for a jar of sauce, but I’m not stupid. So I made it myself. Sometimes, it’s the trashiness and synthetic-ness that gives a dish its special place in your heart. There is a funny subversion in pouring this stuff over a good quality beautiful rib-eye steak. Often the reality will never taste as good as the memory, but that doesn’t stop the quest. Thinly sliced. I don’t think there can be any room for chunky steaks in a sandwich. And some people like to add mushrooms and green peppers, but that just seems wrong to me and to my Philly family, who do suggest that hot chillies on the side are a good and acceptable addition. And it needs to be juicy. Almost dripping. Cheese sauce and steak juice down the front of your shirt kind of dripping. 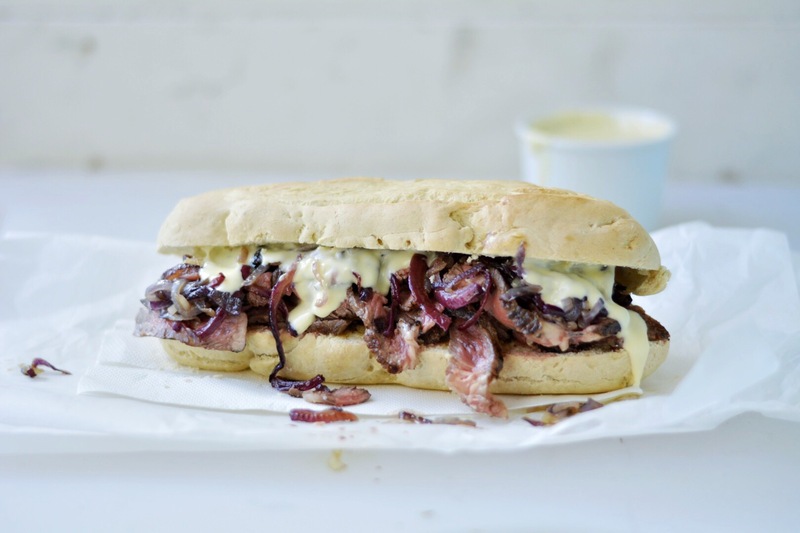 To be honest, you aren’t really going to go far wrong with a good steak sandwich. And if you’re ever in Philadelphia, please pick me up a jar of cheez whiz. Sadly I don’t think the sandwich would travel well. No question, it has to be rib-eye. One thick steak will fill a roll and depending on your appetite, you may eat a whole one, or it could feed two. I could only manage half. Fried onions, hot. I used two red ones, sliced thinly, but only because inexplicably I had no white ones left. Make your bread by mixing the dough ingredients together after the yeast has been foamed in a little warm water. Knead for five minutes and leave to rise for about 45. Shape the dough into four long hoagie roll shapes and leave to rise for another 20. Heat the oven to 180c and bake the bread for about 20 minutes. Remove and leave to cool. If you don’t want to make your own bread, you can use half baguettes or similar. At to toasting or not, that’s up to you, but I don’t believe they are. Cook the very well seasoned steak on a searingly hot griddle pan. I use cast iron and I also give it a very good blowtorching as it cooks to help char the fat and give the meat a little flame-grilled edge. Remove from the pan and leave it to rest while you fry the onions in a little oil added to the steak pan and make the sauce. Mix the cheese ingredients together in the food processor and blend until smooth, taking care to not explode hot milk everywhere because the lid wasn’t on properly. Thinly slice the steak, load it into the rolls and top with the onion and cheez whiz. Get a few napkins and eat.